First cut a 6" x 9" piece of black card stock and fold it in half for the base, a 4 1/4" x 5 3/4" piece of Stampin' Up! Concord Crush for the middle layer, a 4" x 5 1/2" piece of Stampin' Up! Sweet Shop Designer Series paper for the front layer and a 3" x 4" piece of black for the strip. Then punch the strip's edge with a Martha Stewart Doily Lace Edge punch, dry emboss it with a Cuttlebug Swiss Dots Embossing folder, attach it to the front layer and set it aside. Next cut out the image's background with a Spellbinders Beaded Ovals die, the image and sentiment with Spellbinders Classic Ovals dies and the sentiment's background with a Fiskars scalloped oval punch. Then double stamp (ink the stamp, stamp on scrap paper then on your card stock w/out re-inking) the stem's solid layer in Stampin' Up! Pear Pizzazz ink and regular stamp the stem's highlight layer in Pear Pizzazz as well. Next stamp the blossom's first layer in Stampin' Up! 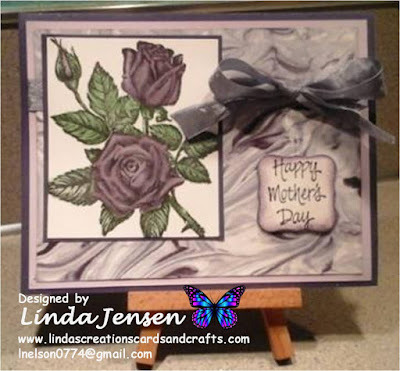 Elegant Eggplant ink, the second layer in Wisteria Wonder ink then double-stamp the third layer in Wisteria Wonder ink, attach the image to it's beaded oval background then to the front layer. Then stamp the sentiment, attach it to the scalloped oval background then attach it to the front with a mini pop dot. Next cut out the butterfly with a Stampin' Up! 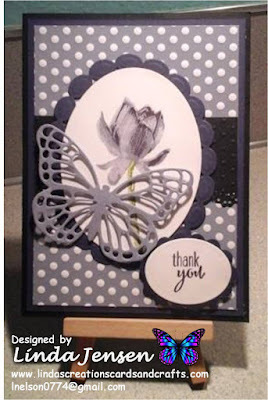 Butterfly Thinllits die, attach it to the front layer with a mini pop dot then attach the front layer to the middle layer then to the base and enjoy!